Sean Dyche believes there is a lot more to come from his squad at the top level. Despite exiting the FA Cup on Saturday at runaway Premier League leaders Manchester City, Dyche – who made four changes to an already depleted line-up – felt his players gave a fine account of themselves at the Etihad Stadium. 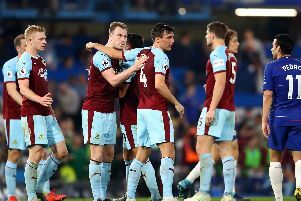 He brought Kevin Long, Ashley Westwood, Matt Lowton and Sam Vokes back into the side, and he was particularly impressed with Westwood, whose last start came in the Carabao Cup defeat on penalties to Leeds United in September. Steven Defour and Jack Cork have started every Premier League game, meaning Westwood has been restricted to 10 appearances, seven as substitute this term. And Dyche said: “Fantastic mentality, he’s a top class professional, which is why we signed him. “He’s been unfortunate because the form of Defour and Cork has been very good, Hendrick working in front of them, so I think Westy is a little bit unfortunate, not because of his own performances or professionalism, but because they’ve played really well. “Barnesy was terrific, he came off the left as he has before for us, and at Brighton. “Kevin Long will get a lot from that, the quick, clever play, the movement around you, things a centre half who’s not young in years, but is young in his real development at this level. Dyche added: “The fitness of some of the lads who haven’t played that much, Vokesy, Westy, was good, but the details cost us. “I think (City) had five efforts on target, and four goals. That’s sometimes what you get for £50m per player. “We’ve got to develop that, it can’t be done overnight, season on season we’ve been adding and adding, but there isn’t a short fix, so we have to be aware of that. And he has been given some nice reminders by some of his squad, that they are ready to perform: “There was a real good energy, good platform to play from with the organisation, countered on them many times, threat from set pieces, and it was only a little, vital period - you concede one, you can’t concede again so quickly, which is where we’ve got to continue to develop. “Stay focused, tuned in, stick with the basics of the side, until the game calms and you get a foothold again. “But that doesn’t develop overnight, that’s a time thing.